Trade conflict between the United States and other major trading partners has roiled financial markets which have experienced volatility following significant corrections. The FTSE Mondo Visione Exchanges Index, which aims to reflect market sentiment and is a key indicator of exchanges performance closed at 49,178.69 on 31 July 2018. The FTSE Mondo Visione Exchanges Index best performer by capital returns in US dollars was the Multi Commodity Exchange of India with a 20.5 per cent increase in share price from 29 June 2018 to 31 July 2018. The next best performer was Brazil’s B3 SA with a 19.1 per cent increase, followed by Mexico’s Bolsa Mexicana de Valores SAB de CV with a 12.3 per cent increase over the same period. 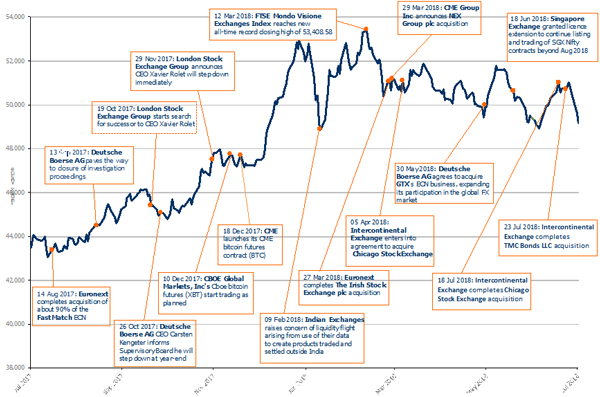 The FTSE Mondo Visione Exchanges Index worst performer by capital returns in US dollars was Cboe Global Markets. with a 6.7 per cent decrease in share price from 29 June 2018 to 31 July 2018. This was followed by India’s BSE with a 5.6 per cent decline and the Moscow Exchange with a 4.7 per cent decrease over the same period. The FTSE Mondo Visione Exchanges Index is compiled by FTSE Group from data based on the share price performance of listed exchanges and trading platforms. Click here to download July's performance report. It enables investors to track 28 publicly listed exchanges and trading floors and focuses attention of the market on this important sector.